Some vitamin D foods do exist that contain vitamin D naturally. However, the selection is not extensive. However, many foods do not contain vitamin D naturally and therefore individuals need to be very selective on what they eat to get good quantities of vitamin D into their bodies. Most of the food sources rich in vitamin D are fortified with the vitamin. Fatty fish are perhaps the best natural food sources of vitamin D and are foods rich in vitamin D. Fish such as salmon, mackerel, and sardines are good vitamin D sources. Cod liver oil is as well. After fish, the best option for obtaining vitamin D via food is by consuming fortified foods. Common fortified foods that are good vitamin D sources are milk and a wide variety of breakfast type cereals. Foods can be fortified with vitamin D2 or D3. 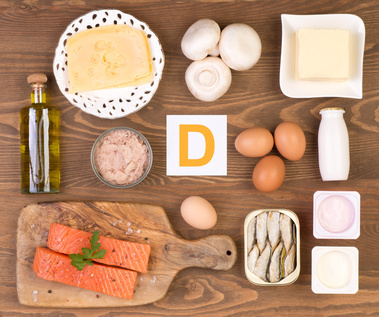 Listed below are some more specific details on foods with vitamin D including how much vitamin D is provided by a certain amount of the food. As a reference, the daily vitamin D requirement ranges generally from 400 to 800 IUs, depending on age and other factors. Vitamin d benefits can be obtained from consuming cod liver oil because it is an excellent food source of vitamin D. One tablespoon or 15ml provides about 1,300 IUs of vitamin D.
Three and half ounces or about 100 grams of cooked salmon or mackerel provide about 350 IUs of vitamin D. Both of these types of fish are very good vitamin d foods. Consuming one and three quarter ounces or about 50 grams of canned sardines provides an adult with 250 IUs of this vitamin. Three ounces or 90 grams of canned tuna in oil provides 200 IUs of vitamin D.
One egg yolk provides 20 IUs of vitamin D. This is a natural source of vitamin D but a very low amount compared to the other foods mentioned above. Three and a half ounces or about 100 grams of cooked beef liver provides 15 IUs of vitamin D. As was the case with egg yolks, beef liver is a natural source of vitamin D, but unfortunately it does not provide a large amount of the vitamin. Milk is one of those very good foods and rich in vitamin D because it is fortified with vitamin D. The required amount of milk to drink in order to achieve the recommended daily intake varies from country to country and of course depends on how much vitamin D is added. For example, in the US, one cup of milk usually provides 400 IUs of vitamin D. Drinking milk fortified with vitamin D is an excellent way of easily obtaining the daily requirement for this vitamin. Other dairy products such as cheese and ice cream are generally not fortified and therefore may not be good food sources of vitamin D.
Usually a cup or 250 ml of dry cereal will provide approximately 40 IUs of vitamin D. Like milk, this depends on the amount of fortification. Because cereal is normally eaten with milk that is fortified, eating a bowl of cereal in the morning is an excellent way of getting a good portion of the daily vitamin D requirement. Other foods with vitamin d include mushrooms and shrimp and some foods such as orange juice, margarine, yogurt, and soy beverages may be fortified with vitamin D. Always, check the labeling of the product to see which foods are indeed good vitamin D foods or foods high in vitamin D.